Hi friends! Can you believe that August is over half over? WOW...I think time goes faster when you get older, not that I am old..but I am defiantly older, as in, over 40, but 40 is the new 30, right? Please say yes, it would totally make my day! 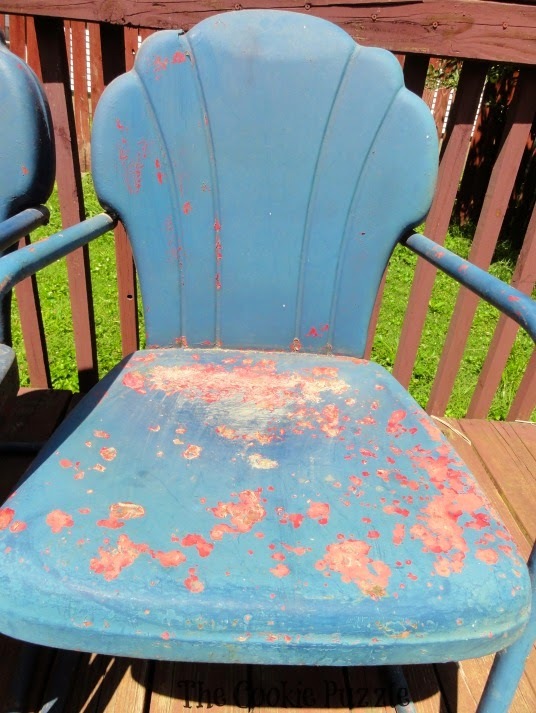 Speaking of old...I have had these old metal chairs forever...they are OLD. I am not sure where I got them, but they have been painted many colors...here, you see them blue, with little red peaking through, with just a touch of rust too..beauties I tell you, beauties in the rough! I decided to spruce them up a little before I moved them to the new house. Using Chalk Paint. 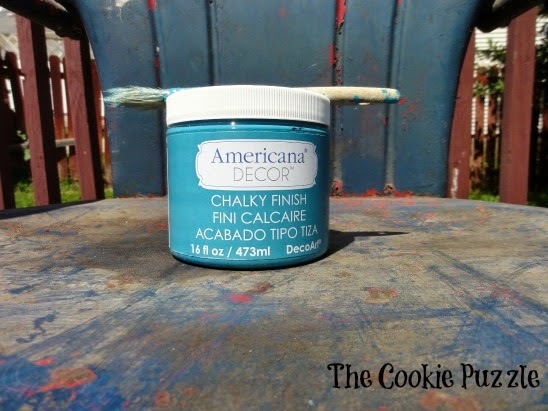 I used Americana Decor Chalky Finish paint, in Treasure. I am sure the "experts" would tell me that I should have sanded before painting them, but I didn't, I just wiped them down good, removing any large paint flakes, then painted them with two light coats of paint, then two coats of Americana Decor Soft Touch Varnish. If you have not used the Soft Touch Varnish, I can not recommend it enough, it is very durable, yet, soft, and can be used for interior or exterior furniture. I love this stuff. 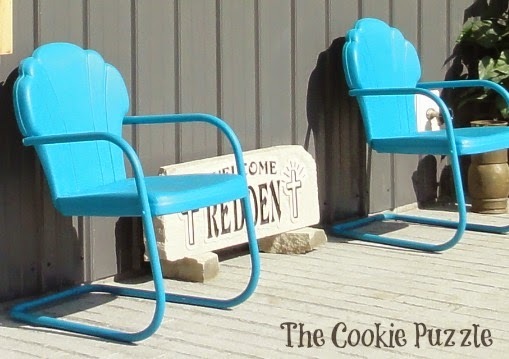 Here are the chairs, all painted up, and on the front porch of our new house. I love the color! Even without sanding, they are still soft and smooth. That is the joy and advantage of using chalk paint, it will cover anything! I chose NOT to distress these, and am am happy that I made that decision, they are perfect for the porch, as it has some other rustic features, which I will share later. 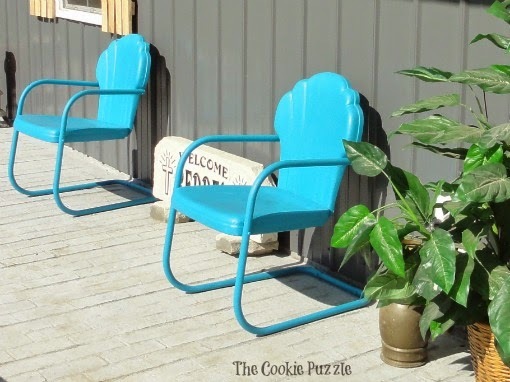 A cool finish on the concrete, which you can see a little bit of, and some rustic shutters that Mr. Cookie Puzzle made. But, I will save them for another post on another day. 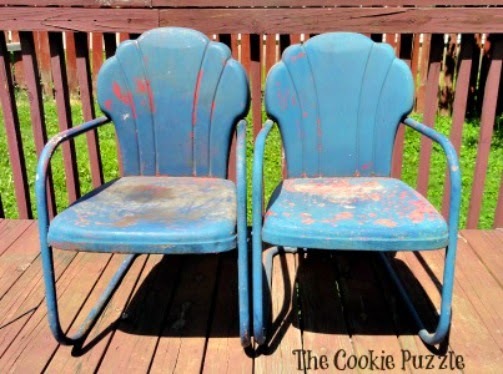 So..if you have some old metal chairs hanging around, give them a new life, with chalk paint!